It was love on first sight. 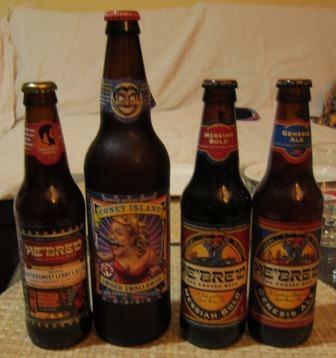 The moment I saw a picture of Shmaltz’ Coney Island lagers on Beer Ticker and Traveler Dror’s blog (The most appropriate Hebrew alert so far), I knew I had to get me a bottle. I mean – Coney Island’s sideshow AND beer for the same price – the best bargain ever since Route 66 Root Beer. When my Excellent Little Brother flew with his wife, ala Li’l SIL to NY last summer, in order to find an apartment and help her settle down before school starts, I sent him to Wholefoods with a small wish-list and he came back to Israel with a bottle of the Sword Swallower (and Southern Tier Oak Aged Unearthly and Oomegang’s Three Philosophers). Don’t remember whether I asked him to bring this one specifically or let him choose whatever he fancies. In any case, The Sword Swallower that arrived at our place last September graced our fridge with her beauty while we were patiently waiting for a good opportunity to open that bottle. A short correspondence with don’t remember who revealed that Dror has a He’Brew bottle at home. He was willing to share his stash and after a few weeks of messaging back and forth we found one evening that the three of us were free to meet. Much to our delight Dror brought along 3 different bottles, one of which appears in the 1001 book – cool! All four bottles were past their prime. Ours was bought in August, Dror’s even before that. 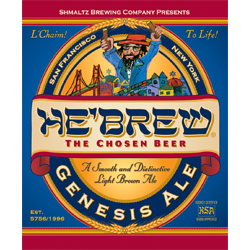 We started with Genesis Ale, Shmaltz’s first creation (that recently underwent face lift). This amber ale pours hazy red with some while foam and sports oily citrus-honey aroma. It has rich, bitter taste with faint hoppiness. After a few sips the taste become sweeter. With a medium body, oily feeling and bitter finish this is a fun beer to drink – it’s mellow and sweet. Not too extreme, but that’s just fine. Second was the brown ale now sold as Messiah Nut Brown Ale but sold to Dror in days of yore as Messiah Bold. This one pours cloudy coke-coloured with a minimal tan head. I smelled roast, soft chocolate aromas and wine. Taste was roasty as well, sweet with apparent chocolate. Its body was thin and watery, finish was long and carbonation pretty muchlong gone. This was the weakest link in the tasting. 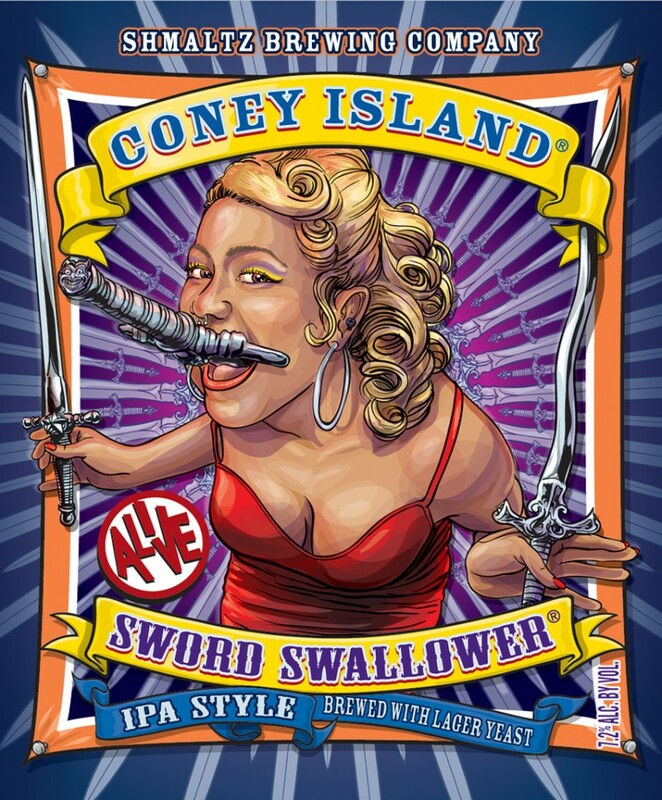 Our bottle of Coney Island Sword Swallower, IPA brewed with lager yeast, came next. This beer with hazy golden colour with minimal white head bore the aroma of date honey and vanilla – the Body Shop kind of heavy vanilla. It starts sweet and innocent but then the taste explodes into bitterness. It’s a little oily and sleek medium-bodied beer, carbonated with a long and bitter finish. Weird beer but I liked it. We finished with Bittersweet Lenny from page 64 in the book. Ruby copper colour, cloudy with tan foam. Its aroma is rich, full of raisins and alcohol. Its taste is bitter, soapy with some fruit. Long aftertaste, full body, smooth with minimal carbonation. Dror was kind enough to leave us the labels, so we him donated the Coney Island bottle cap.